January 10, 2014, 1:56 PM · When instructing the very youngest of students, violin teachers often begin with a box violin, to acquaint them with the mechanics of holding the violin before actually putting the instrument in their hands. Older violinists share memories of their first "violin" -- for example, one described her teacher who would wrap Cracker Jacks boxes in wrapping paper to use as box violins, then when the students graduated to the real thing, they got to unwrap them and eat the popcorn! As a teacher, I don't always use a "box" violin for every beginner, particularly if the beginner is over the age of, say, eight. But it can be a very useful tool in teaching young students, who tend to learn violin skills in small steps. If they've become very comfortable with having a box violin on their shoulders, the whole process goes much more smoothly, when they finally get the "real" thing. With no preparation, they tend to start by grabbing the fiddle with their left hand and immediately sawing away, with no regard for position, and thus the cascade of bad habits begins. When I was a kid and the Suzuki Method was young in America, it was not uncommon to make the cardboard violin from a cigar box -- something which is no longer easily found in most homes! But, I'm finding that the egg cartons are just too thick, especially for students that will be using a violin that is smaller than a quarter-size. I suddenly have several new, very young students, so I thought it was time to change it up a little and solve the thickness problem. I asked Facebook friends over at the Suzuki Teaching Ideas Exchange, and they came up with the following ideas for boxes: a macaroni and cheese box, Kleenex box, Fruit Rollups box and butter box. 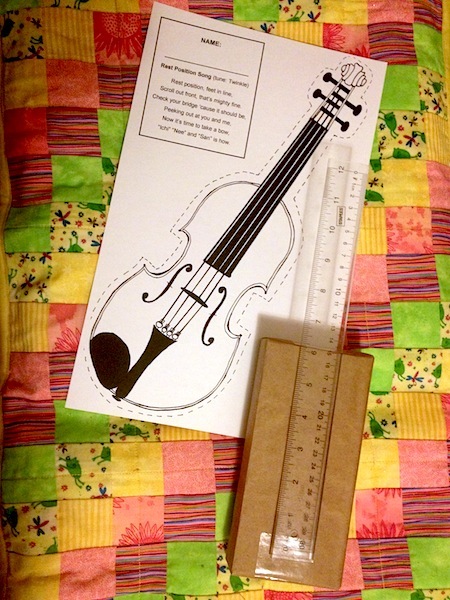 One colleague from Germany even gave me information about exactly how thick a cardboard violin should be, to match its corresponding-sized fractional violin, check out this PDF, page 12. Also, there are pre-made pre-violins that one can buy, if one is less craft-oriented: for example, the Cherub Box violin from Shar, or the Blue foam violin from Southwest Strings. I wrapped a macaroni and cheese box in paper from a brown bag. Then we attached a ruler, using packing tape, then glued the cut-out onto this "box." This little craft project worked nicely for a first lesson; before we glued anything, my new student colored her violin (pink) as we listened to violin music and I answered her parents' questions. Then we assembled her "violin." January 10, 2014 at 09:22 PM · There should be a law that these things have to be made from post-consumer content. The idea that the child can color it -- or eat the contents -- is wonderful. Fiddle Faddle has the right name and it comes in a bigger box than Cracker Jack. I think the most important first thing any kid wants to do with a violin, above all else, is to play a tune. I think the goal of the first lesson should be to play A-A-E-E-F#-F#-E (Twinkle) or C#-C#-D-D-C#-C#-B-B (Boil 'Em). You might have to stand behind them holding their hands in yours, but I think just about any kid can do it. January 10, 2014 at 10:36 PM · Hi Paul, four-year-olds can't generally play Twinkle on the first day. I haven't met many complete-beginner adults who can, either! But Twinkle is recognizable to just about everyone and makes for an excellent first milestone.